Stranger Things Season 2 actress Sadie Sink has opened up about that controversial unscripted kiss, which has been sending shockwaves through the Stranger Things fan community. First of all, there may be POTENTIAL SPOILERS ahead, so read on at your own risk. Sadie Sink, who portrays Max, revealed on the Beyond Stranger Things show that the kiss between Lucas and Max was unscripted and that it made her "stressed" out. Show creators, the Duffer Brothers, went on the defense and accused the 15-year old star of bringing it on herself because she became so uncomfortable when they "jokingly" brought it up, they had to shoot it. Putting all the blame on the actress has caused quite a bit of backlash. The Snow Ball dance scene at the end of the final episode was heartwarming, to say the least. We finally see Lucas and Max let their guards down and share their first kiss. The adorable scene was incredible stress-relief for fans of the show, but it apparently was not for the young Sadie Sink. Sink said that she was notified about the kiss the day of the shoot while speaking on the Stranger Things after-show, but it appears as though the kiss might not have been as stressful as Sink let on. 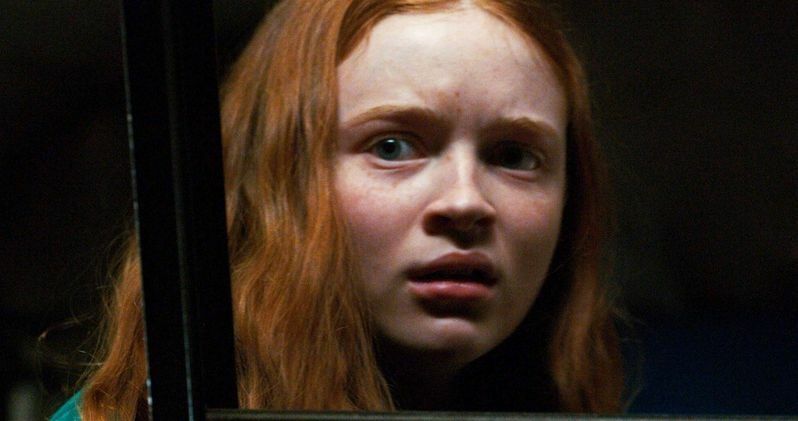 In a recent interview with The Wrap, Sadie Sink revealed that she never "objected" to the kiss and that she always felt comfortable with the Duffer Brothers. She also revealed that it was both Caleb McLaughlin's (Lucas) and her first kiss in real-life as well. Sink had this to say. "I mean, of course I was nervous because it's a first kiss, right? But I never objected to it or felt pushed into anything." Sink went on to say that the kiss was a vital part of the scene and the ending of Season 2 of Stranger Things as a whole. The young actress also reiterated how comfortable she was with the Duffer Brothers on set. Sink explains. "I always felt comfortable and the Duffer Brothers, they do the best job. And always create a comfortable space. And if I felt uncomfortable with anything, I wouldn't have done it." In an interesting twist, The Wrap pushed a little further on the 15-year old actress and asked if anyone on the show had notified her prior to the day about the kiss, to which some uncomfortable silence filled the room. Sadie Sink's publicist swiftly came to the rescue, saying that she believed that the question had been fully addressed. Though Sink says she was comfortable with the scene, it still looks as if it was a total surprise and sprung on her the day of the shoot. In the end, the scene turned out great, but fans of Stranger Things may still be mad after Sadie Sink claims that she was always "comfortable" with the scene, even though it had been brought up at the very last minute. However, Sink went on to say that she and Caleb McLaughlin were both "really comfortable" with each other since they had known each other before Stranger Things while growing up in New York City. Who knows, maybe the Duffer Brothers used that familiarity and a surprise to make the kiss more realistic, but if that is the case, they probably could have explained it a little bit better on Beyond Stranger Things. You can read more of the interview with Sadie Sink via The Wrap.